Image linked from Robert Eugene Smith blogspot. I've often said I'd like to a be a "Grandma Moses" of writing. I have the "late in life" start down, but I probably will never be celebrated with a Life Magazine article. 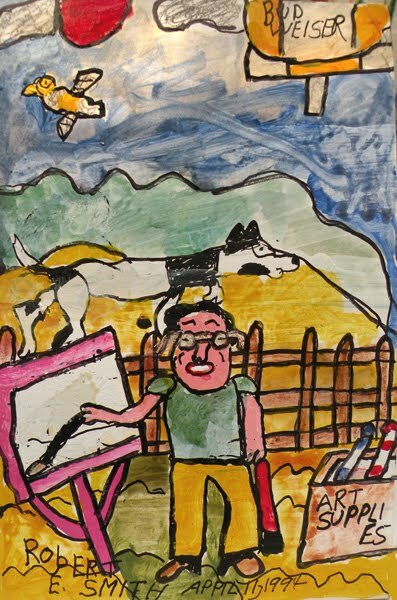 A painter in the style of Grandma Moses died in Springfield, Missouri over the weekend, Robert E. Smith. But Smith, whose primitives appeared Moses-like, also had a playful air about his life and work. Smith was known as a folk -- or "outsider" -- artist because he did not have classical training. His work has been displayed in many exhibitions, including in New York and Chicago. Crigger said an exhibition of Smith's work at MSU in 2007 was the most attended exhibit that gallery has ever had. "He did not just paint paintings," Crigger said. "He also painted objects, such as tables, chairs and TVs." Crigger said Smith once was trying to sell an old black and white television "at garage sale prices" and could not get anyone to take it. Crigger said he suggested that Smith paint it. "He painted it, and the artwork had a whole story behind it and I think it sold for several hundred dollars," Crigger said. I'm not one much for nonrepresentational art. I have no luck deciphering Pollock. Conversely, not every painting needs to be a Norman Rockwell clone. Smith's work -- its free-spirited, child-like quality -- may not come to be considered great classic art, but it displayed a wonderful artistic integrity. Just got around to this. I hope the guy does well. It's hard to judge a painting from a small picture, but this one looks good. But I thought you liked surrealists--I'm still a fan of Magritte and Delvaux.